One area where you might not think to use a checklist is when you’re sending email, but they can really make a difference. Used well, a good email checklist can ensure you’re sending messages that get responded to, help you avoid making mistakes, and keep you productive. 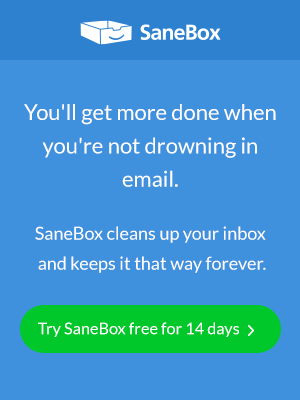 Read on for the SaneBox Scoop on effective email checklists. The best way to use an email checklist is for it to become second nature. That means you need to be able to tweak a checklist to your exact needs. After all, if it’s too cumbersome, you’ll eject it out of the cargo bay doors, never to see it again. That means you should take the bits and pieces from the checklists below and adopt the ones that make sense to you. Additionally, you won’t use the same email checklist every time. You might use a full checklist if you’re writing a cover letter when applying for a job, a smaller checklist when you’re writing to a client, and a very brief one if you’re requesting time off. What we’re trying to say is, don’t let us tell you how to use checklists. Give these ones a try and then make them your own. Confirm that email is the best medium for this message — would a phone call, Skype, Slack, or some other service be better? Make sure you have the correct names in your email address fields. Use “To,” “CC (Carbon Copy),” and “BCC (Blind Carbon Copy)” properly. Double-check the email is going to the right people and only the right people. Keep your subject line short and to the point. If action is needed, state it in the subject line. Use the subject line to describe clearly what the email is about. Incentivize people to respond in the subject line. More on writing effective subject lines here. Make sure you use the right salutation and greeting in the email. Adopt the right style and tone for the email — formal, informal, or somewhere in between. Get to the point quickly, don’t waste time. State the details of why you are writing in the first couple of lines. State the action the recipient needs to take (if any) in the first paragraph. Use short paragraphs and ensure you only cover one or two points in each paragraph. Keep your sentences short and clear. Use bulleted or numbered lists if it makes sense. If you’re answering questions, repeat the question before providing the answer. If the recipient might be interested in further information, include an attachment or link. State when you need a response by (if any). Ensure you include other ways of getting in touch. Double-check you have attached the right attachment. Double-check you’re only sending the email to intended recipients. Proofread your email for spelling, grammatical, or other errors. Use the SaneReminders and SaneNoReplies tools for follow ups. And that’s it! Tweak, mix, and match these checklists for a simple, beautiful solution that will rocket your emails into other’s inboxes.